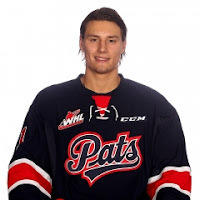 The Regina Pats are awaiting the results of tests on F Filip Ahl to learn whether the mumps virus has found them. Ahl missed his third straight playoff game on Tuesday night — the Pats dropped a 5-4 decision to the Broncos in Swift Current in a game that went to triple OT. Ahl, a 19-year-old freshman from Jonkoping, Sweden, was a fourth-round selection by the Ottawa Senators in the 2015 NHL draft. He had 48 points, including 28 goals, in 54 games with the Pats this season. The Brandon Wheat Kings, Medicine Hat Tigers, Swift Current Broncos, Victoria Royals and Kamloops Blazers all have had players, coaches or others associated with them impacted by the mumps virus. MORE ON THE MOVE: D Chaz Reddekopp of the Victoria Royals has joined the Ontario Reign, the AHL affiliate of the NHL’s Los Angeles Kings. A seventh-round pick in the 2015 NHL draft, Reddekopp had 10 goals and 33 assists in 51 games this season. He suffered a broken foot while blocking a shot late in the season and missed a chunk of games. . . . D Josh Anderson of the Prince George Cougars will finish the season with the AHL’s San Antonio Rampage, which is associated with the NHL’s Colorado Avalanche. 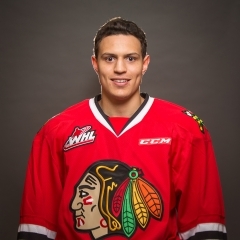 This season, his third in the WHL, Anderson had 11 points, three of them goals, in 69 games. He was a third-round selection by Colorado in the NHL’s 2016 draft. The Kamloops Blazers have signed D Sean Strange, who was a 10th-round selection in the 2015 WHL bantam draft. Strange, who turned 17 on Jan. 25, is from Saanich, B.C., and has played the past two seasons with the South Island Royals of the B.C. Major Midget Hockey League. This season, he had four goals and 12 assists in 39 games. F Graham Millar, who completed his junior eligibility this season, will attend UBC in Vancouver and play for the Thunderbirds next season. Millar, from Penticton, split this season between the Everett Silvertips and Edmonton Oil Kings, totalling 30 points, including 12 goals, in 48 games. . . . In 249 regular-season WHL games, he put up 97 points, 47 of them goals. Danton Cole is the new head coach of the Michigan State Spartans. Cole, 50, has spent the past seven seasons with the U.S. National Team Development Program. . . . Cole has been coaching for 18 seasons. . . . A Michigan native, he played at Michigan State before going on to a pro career that included a Stanley Cup championship with the 1994-95 New Jersey Devils. . . . Cole replaces Tom Anastos, who had a 78-122-24 record over six seasons. the Everett Silvertips. . . . Seattle holds a 3-0 lead in the second-round series with Game 4 scheduled for Kent on Friday night. . . . The Thunderbirds swept the Tri-City Americans from a first-round series and now are on the verge of doing the same with the Silvertips. . . . Seattle has done this with Carl Stankowski in goal, after Rylan Toth, who played in 58 regular-season games and led all WHL goaltenders in victories (36), was taken out by an undisclosed injury. . . . Stankowski, a Calgarian who turned 17 on March 9, is 7-0 in the playoffs, after going 3-0-1 in the regular season. . . . The Thunderbirds scored the game’s first three goals, only to have the Silvertips get the next four. . . . Seattle took that 3-0 lead on goals from F Keegan Kolesar (4), at 12:35 of the first period, F Nolan Volcan (3), at 0:32 of the second period and F Alexander True (4), at 3:33. . . . D Aaron Irving (2) got the visitors on the scoreboard at 7:22, with F Eetu Tuulolo getting them to within a goal, on a PP, at 9:41. . . . F Dominic Zwerger (3) tied the score, on a PP, at 13:29, and Tuulolo (6) put Everett out front, at 14:37. . . . Barzal, who finished with two goals and an assist, got Seattle back into a tie at 4:23 of the third period. . . . Zwerger also had two assists for Everett, with Tuulola adding one. . . . Stankowski finished with 14 saves, while Everett’s Carter Hart stopped 28 shots. . . . Everett was 2-3 on the PP; Seattle was 0-2. . . . The Thunderbirds had F Ryan Gropp back in the lineup after he missed the previous four games with what is believed to have been a concussion. 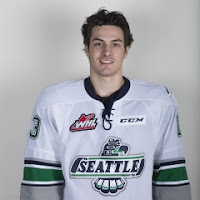 Seattle head coach Steve Konowalchuk chose not to reunite one of the WHL’s top lines — Barzal between F Keegan Kolesar and Gropp — but they were together for the OT winner. Gropp picked up the lone assist. . . . Announced attendance: 5,141. Regina Pats. . . . This was the third OT game of the series. The Broncos won Game 1, 2-1, in Regina on Thursday and then beat the visiting Pats, 2-1, on Monday night. . . . The Broncos, who finished third in the East Division, lead the series, 3-1, and can eliminate the Pats, who finished atop the WHL’s overall standings, on Friday night in Regina. . . . Last night, Broncos F Ryley Lindgren broke a 3-3 tie with 2:25 left in the third period, but the Pats tied it when F Dawson Leedahl scored his fourth goal of the game at 19:39 with G Tyler Brown on the bench for an extra attacker. . . . Leedahl had given the Pats a 2-0 first-period lead with goals at 9:10, on a PP, and 15:00. . . . The Broncos pulled even on second period goals from Lindgren, at 15:30, and D Artyom Minulin (1), at 19:42. . . . Lindgren also had two assists for a four-point game. . . . Leedahl put the Pats ahead at 4:12 of the third period. . . . Swift Current then took the lead on goals from F Tyler Steenbergen (8), at 6:19, and Lindgren (8). . . . Leedahl forced OT with his eighth goal. . . . Gawdin won it with his fourth goal of the playoffs, the PP score coming at 9:54 of the third extra period. . . . D Colby Sissons, who scored the winner on Monday, had two assists for the Broncos, with Gawdin and Steenbergen adding one each. . . . F Sam Steel and D Josh Mahura each had two assists for the Pats. . . . 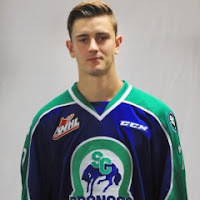 The Broncos got 65 saves from G Jordan Papirny, including 31 in OT. . . . G Tyler Brown stopped 64 shots for Regina, 36 of them in OT. . . . Each team was 1-3 on the PP, with the Broncos getting two of their opportunities in OT. . . . The Pats continue to play without F Jake Leschyshyn (knee), F Adam Brooks (suspected knee injury) and F Filip Ahl (mumps symptoms). . . . Broncos F Mackenzie Wight completed his two-game suspension by sitting out this one. He was suspended under supplemental discipline for an unpenalized hit in Game 2 on which Brooks was injured. . . . Announced attendance: 2,890.
the Kelowna Rockets. . . . Kelowna still holds a 2-1 lead in the series with Game 4 scheduled for tonight in Portland. . . . They’ll be back in Kelowna for Game 5 on Friday. . . . F Evan Weinger (2) gave Portland a 1-0 lead at 4:06 of the first period, with the Rockets tying it on F Calvin Thurkauf’s second goal, on a PP, at 11:23. . . . F Joachim Blichfeld (4) gave Portland the lead at 5:29 of the second period, on a PP, with D Caleb Jones (1) adding a goal at 16:41 and F Skyler McKenzie getting his fourth goal, shorthanded, at 19:03. . . . Thurkauf added another PP goal at 18:33 of the third period. . . . F Ryan Hughes had two assists for the winners, with Jones and Blichfeld adding one each. . . . Kelowna got two assists from F Reid Gardiner. . . . Portland G Cole Kehler blocked 28 shots, two more than Michael Herringer of Kelowna. . . . Kelowna was 2-4 on the PP; Portland was 1-5. . . . The Winterhawks were upset that Kelowna D Cal Foote wasn’t given a major penalty for a hit on McKenzie at 19:20 of the third period. Foote ended up with a minor penalty for what the Winterhawks felt was a high hit. . . . Announced attendance: 4,407. Mike Johnston wants a 5-minute penalty here but he's not getting it this is about as mad as you'll ever see him get. Line up! Who's next for noogies? At Lethbridge, the Hurricanes scored the game’s last five goals and beat the Medicine Hat Tigers, 5-2. . .
. The Hurricanes hold a 2-1 lead in the series, with Game 4 scheduled for tonight in Lethbridge. . . . Medicine Hat grabbed a 2-0 lead on goals from F James Hamblin (2), at 12:27 of the first period, and F Mark Rassell (5), at 8:39 of the second. . . . Lethbridge got to within a goal when F Jordy Bellerive (3) scored at 12:13 of the second period and F Giorgio Estephan tied it, on a PP, just 1:04 later. . . . F Tyler Wong’s seventh goal, on a PP, gave the Hurricanes the lead, at 4:04 of the third period. . . . Estephan provided insurance with his seventh goal at 11:28, and D Brennan Menell (4) got the empty-netter at 18:58. . . . Estephan also had an assist for a three-point night. 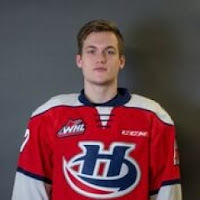 He has seven points, including five goals, in his past two games. . . . Menell had two assists and Wong one for Lethbridge. . . . Hamblin had an assist for the Tigers. . . . G Stuart Skinner blocked 36 shots for Lethbridge, 10 more than Medicine Hat’s Michael Bullion. . . . The Hurricanes were 2-4 on the PP; the Tigers were 0-1. . . . Medicine Hat took 50 of the game’s 84 penalty minutes, 76 of which were handed out at 19:40 of the third period. . . . D Calen Addison, F Matt Alfaro and F Zak Zborosky were among Lethbridge’s scratches. . . . Announced attendance: 4,563.